Delicious inspiration from Corner Social in Harlem: Jumbo Lump Crab Cake with Creamed Leeks and Spinach, Sweet Potato and Scallion Pancakes and Lemon Preserves. I got a jolt of inspiration when dining out recently. Just around the corner from home in Harlem, Corner Social lifts the bar stools, cuts off the basketball, and starts bumping (my favorite) 90’s RnB and hip-hop jams after normal dinner hours finish. 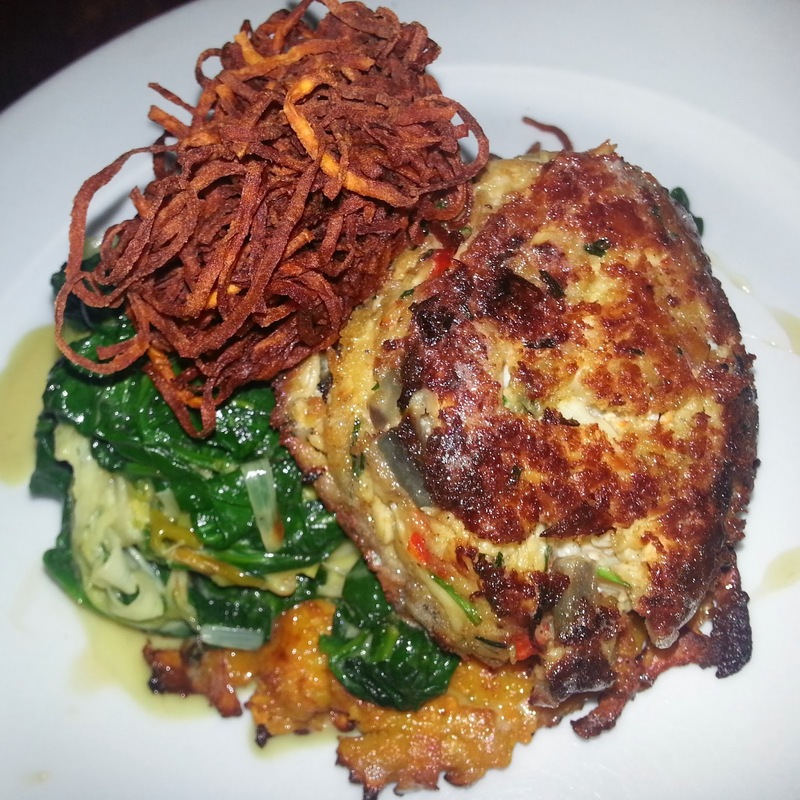 I expected to sit and eat something, but the dish was much better than I anticipated: Jumbo Lump Crab Cake with Creamed Spinach and Leeks and Sweet Potato and Scallion Pancakes with Lemon Preserves. I’ll pause here and acknowledge that I’m super picky when it comes to crab cakes because I grew up on the Potomac River and around the Chesapeake Bay. Crab cakes should not be crab flavored bread disks with more crispy bread crumbs on top. They should be almost pure crab with a bit of Old Bay and maybe a some finely chopped onion and peppers. I’m usually disappointed so when I ordered this dish it was in spite of the crab cakes. Thankfully, these were 100% Maryland approved. I did order the dish because I was curious to see if the Sweet Potato and Scallion Pancakes leaned to “potato pancakes,” like latkes, or the doughy and crisp Chinese “scallion pancakes.” Corner Social piled the vegetables and crab atop a thin and large disc of sweet potato that was soft and barely crisp, soaked in the juices from above. In recreating this dish I decided to keep the cake with the style of latkes and add Chinese flavors from the name association. By frying the thick patties in shallow oil, I left the sweet potato still slightly raw which adds crunch throughout. Like the fish that makes a surprising complement, these sweet potato cakes do not keep well. Make a small batch and eat them up the same night or by morning with scrambled eggs. 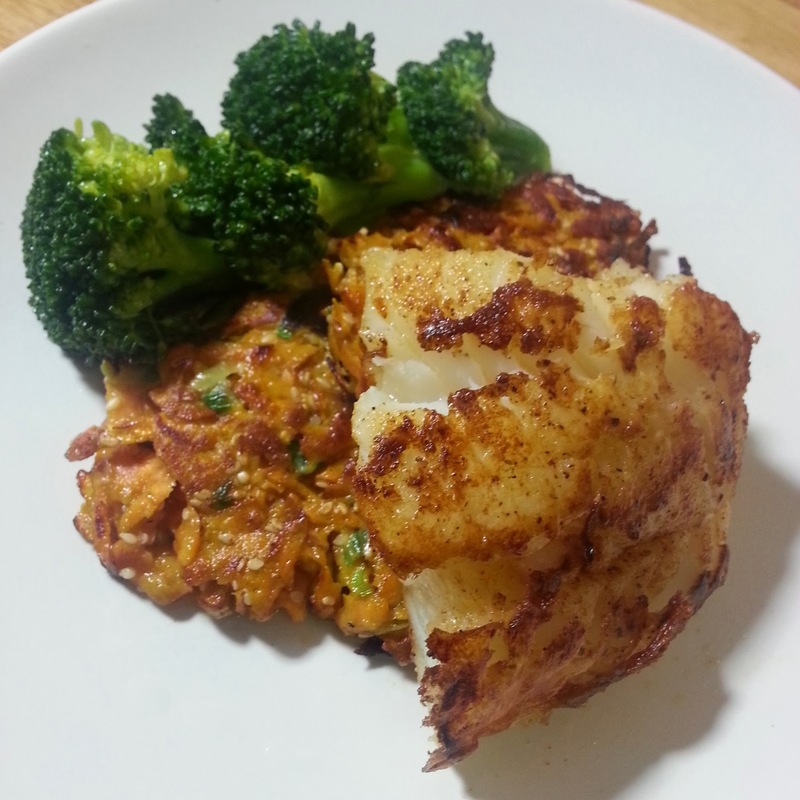 The recreation with Sesame and Scallion Sweet Potato Cakes, Old Bay Seasoned Cod, and Steamed Broccoli. Easy for weeknights. A little bit Jewish, a little bit Chinese. This dish would be perfect for Woks and Lox, an un-Christmas party organized by a friend of mine. Heat a very shallow amount of oil in a heavy pan over medium heat. Mix together all of the ingredients. Squeeze a handful of sweet potato mixture into a ball then flatten to a disk about 1/2″ thick and place directly in hot pan. Cook patties for 5 minutes until golden brown then flip and cook another 3 minutes. Repeat in batches with remaining mixture. Serve immediately. A sweet potato and a box grater. That’s really all it takes, but if you’re making a larger batch, try the slicing disk of your food processor. The scallions add great color and a flavor that blends well with the sweetness of the potato. Always toast sesame seeds and nuts to bring out the oils. Sesame oil is a worthy investment for this recipe – I’ll post a healthy take on the Sichuan Dan Dan Mian (noodles) for you to put it to use. The sweet potato remains a little raw; perfect for a little extra crunch.